Usually the top priority of a traveller in Greece is to visit temples and sites of the classical world. Little attention is paid to the many other interesting memories of Greek history during the Byzantine Empire and after the fall of Constantinople until the emergence of the Greek Kingdom in the XIXth century. Venice played a role in Greece for nearly a thousand years. A possession of the Byzantine Empire, Venice gained political independence in the VIIIth century as a result of the reaction to the Iconoclasm imposed by Emperor Leo the Isaurian and later on became an independent Republic maintaining strict relationships with Constantinople as the Cathedral of St Mark's testifies. Venice was allied with the Byzantine Empire in restraining the expansion of the Normans who, after seizing Bari, the last Byzantine stronghold in the west, had conquered Dyrrachium (today in Albania and known as Durres) in 1081 and attempted to reach Constantinople. Venice sent a fleet to help Emperor Alexius I and in return was granted trading concessions within the Empire, thus gaining a predominant role in Mediterranean trade. The First Crusade weakened the Byzantine Empire and Venice profited by gaining some bases in the Ionian Islands to support trade. In 1125 the little port of Modon in the Peloponnese secured for Venice control over the maritime route between the Ionian and the Aegean seas. As a reaction to a massacre of Venetian traders in Constantinople, Venice manoeuvered the Fourth Crusade into an expedition against Constantinople and ended up with possession of Crete, Euboea and several other islands in the Aegean Sea. The expansion of Venice continued until the Ottoman conquest of Constantinople in 1453. Soon after that the Sultans started a series of wars to gain possession of the Venetian bases. This process lasted more than three centuries. Only in 1715 with the fall of Tinos was the Aegean Sea freed from Venetian presence, but the Ionian Islands were retained by Venice until the Republic fell as a result of Napoleon's first Italian campaign. Venice had no large army, but had a powerful fleet, so the strategy to retain the Greek possessions was based on building fortresses which could resist the Turkish attack until help could arrive from the sea. To achieve this in 1542 a Magistracy of Fortresses was established, which had jurisdiction over fortifications in the maritime and mainland dominions, and over the arsenals of sea territories of the Republic. 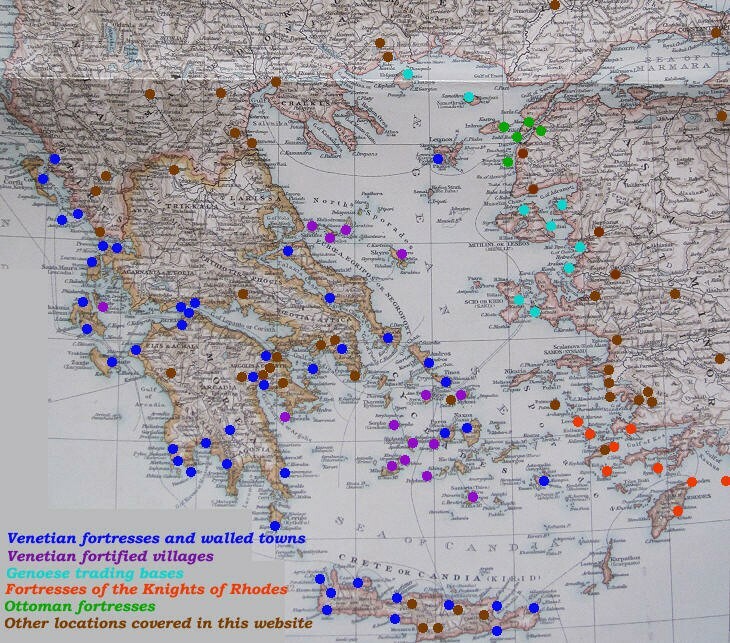 The map (1900 Times Atlas) shows the fortresses built or occupied by the Venetians in Greece. By hovering on the blue dots you can read the name of the fortress (the names are those given by the Venetians) and by clicking on them you move to the related page. For fortresses in Crete the link is to a page giving a brief overview of the Venetian rule over the island and with the links to the page of each fortress. You may refresh your knowledge of the history of Venice in the Levant by reading an abstract from the History of Venice by Thomas Salmon, published in 1754. The Italian text is accompanied by an English summary. You can also read a 1692 description (in Italian only) of the fortresses of Morea and of some other locations. The image in the background of this page shows a relief depicting the winged lion, symbol of Venice.